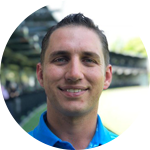 Nicholas Altman is a PGA Certified Professional with over 15,000 hours of golf instruction experience. He is an expert swing analyst and coach, and he uses the latest golf lesson technology to help his students improve. Certified by the Titleist Performance Institute and U.S. Kids Golf, he can work with students of all ages, abilities, and physical capabilities. By focusing on proven fundamentals and the student’s individual swing and ability, Nick will get you results. He will provide specific feedback and a comprehensive plan to help you reach your scoring goals, whether that is to break par or break 100. Usted habla Español? Nick habla y entiende Español con fluidez y puede enseñar tecnicas en golf en Español tambien.